• Break the blocks beneath your opponent's feet to make them fall into the water. • Placing blocks is not allowed. • If both players can't reach each other, the player with access to more land wins. • No form of advantageous items are allowed (Potions, ender pearls, elytras, etc). • No flying or teleporting. • Two players will randomly be matched with each other to 1v1 in spleef, First to 3 wins (Best of 5) advances to the next round of the tournament. The loser will be disqualified. • For a tournament match to count, a staff member must witness (or play in) the match, and then report the results to the host CCShad to update the bracket. • During the match, both players should have an Efficiency 5 diamond shovel. If a contender doesn't own one, a staff member can give them a spawned in one to borrow for their games. • If two players matched against each other don't do their match within 7 days, they will be given a set time and date to play. If both players still can't show up, the match will be settled another way. If only one player doesn't show up, that player will be disqualified. • Rematches can only occur if BOTH players agree to do so and if the match after their own hasn't been played already (I don't want to hear any complaints about "lag"!). To enter the tournament, all you have to do it contact me about it before 9/4/2018, 12:01 AM (EST). You can do this through discord, in-game messaging and /mail, or you can even reply right here on this thread! All I need to know is your full Minecraft username. There is only one requirement to be eligible to join: You must have joined the server over 20 days ago, or possess a donator rank. This is simply to reduce players who might stop playing on the server mid-tournament. I won't be participating in the tournament, but I'll be hosting some of matches! Best of luck to everybody, and shoot for 1st place! Optifine is highly recommended, you may have FPS lag without it. If you have any questions, ask below! Is everyone looking forward to competing for the 2nd place prize? Would like to, but don't agree with the rule "if they cant reach each other, the one with the most land wins" After observing Shad play numerous times, he just about always puts himself on an island early in the game, so don't really see the point when this is going to happen. Also the shovel used should be the same for both sides and minus any enchantments. And yes, both players will have efficiency 5 diamond shovels. I AM INNNN! LETSS GETT READYY TOO RUMBLEEEEEE! @Pres The loser of the finals gets 2nd, and there's a match for bronze between the two losers of the semi-finals. @Aoul It starts on the 4th and will go on throughout the month until every match has been completed. What about a double elimination or a loser bracket? @Max I'm doing single elimination this time around to see how well it works out, if it's a common struggle to get matched players online at the same time, we won't want to do double elimination since it essentially doubles the matches. But if this tournament goes smoothly we might just do a double elimination for the 2nd tournament. Today is the last day to enter the tournament and there's only 6 spots left! If you haven't entered already and would like to, Now's your last chance! The tournament has begun! Find who you're matched against and have a staff member spectate you. Remember to follow both the spleef and tournament rules! 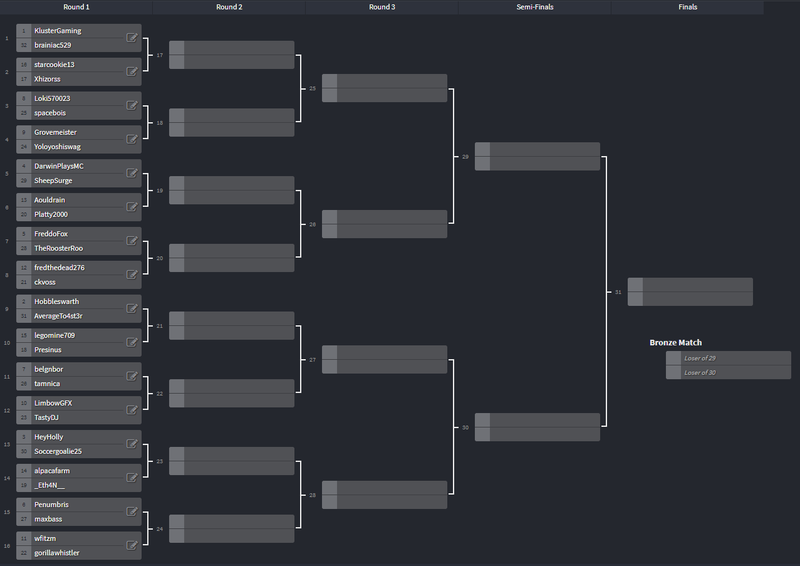 The first round of the tournament is complete and we're over halfway done! Good luck to everybody in the 2nd round. I plan on hosting the next tournament either at the end of this month or at the start of next month, keep practicing everybody, and good luck in the future!